When you land amidst the ruins of the old sulphur factory, you wonder what it must have been like living in this desolate place for months at a time. The volcano itself descends some five thousand feet below sea level to reach the seafloor, but its crater and surrounding rim extend a mere 300m above the sea. This makes it one of the most accessible volcanoes in the world, with no need to traipse up a mountainside for hours to reach signs of volcanic activity. The tour itself is little more than a pleasant stroll, albeit through steam that hangs ominously in the air. Indeed, in Maori its name means “the dramatic volcano”, and as you approach the island by boat, you get a bubbling sense of anticipation. The steam that emits from the island’s centre seems to merge seamlessly with the blue sky, forming a backdrop of white clouds. It is this ever present cloud that caused Captain Cook to name it “White Island”. We booked a tour on Peejay, and spent the day exploring! These days, the volcano is closely monitored for signs of activity, and tours do not run if there is any real danger. Despite this, as you leave the boat everyone is issued with a gas mask and helmet. White Island is New Zealand’s only active marine volcano, and it is indeed pretty lively! 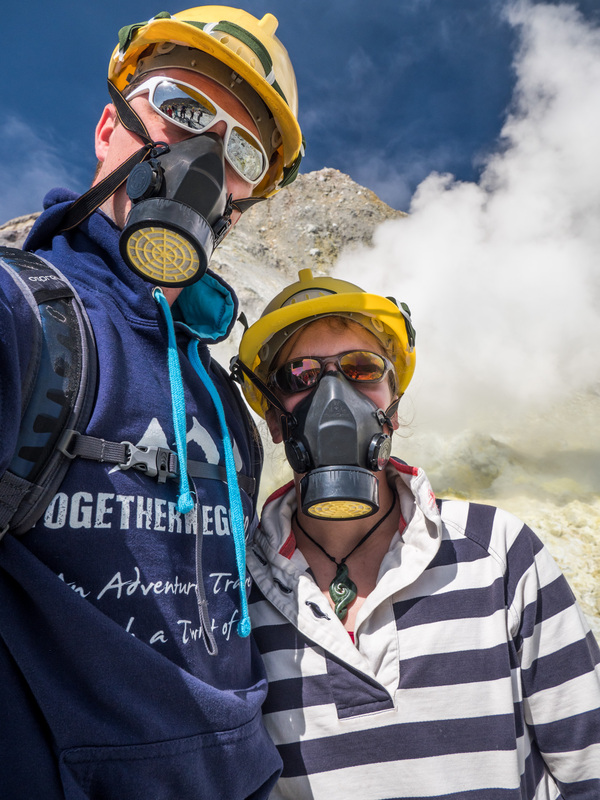 The ground is warm enough in places to feel the heat seeping through your shoes whilst pressurised steam pours out of vents in the ground and cliff face. Several mineral rich streams run through the island flowing out into the ocean and pools of bubbling mud can also be found. Almost nothing grows here, leaving the island barren, strewn with clumps of rock from previous eruptions. In this case though, barren is beautiful with hues of orange and yellow, caused by the high levels of sulphur on the island. Not so pleasant is the cloying sulphuric smell that hangs in the air and sticks in the back of your throat. The tour guides handed out sweets to help reduce the coughing that spread throughout the group. A word to the wise, if you have asthma, however mild take your inhaler with you! I mistakenly left mine on the boat and chain sucked both mine and Ian’s allotted sweets in a desperate attempt to keep an attack at bay. The tours follow a set path, with guides leading small groups to see the main sites, allowing time for various photo opportunities. Occasionally a thump-thump-thump can be heard as helicopters fly by, carrying more affluent tourists, giving them a bird’s eye view of the island. The tour ends back at the beginning in the ruins of an old sulphuric mining factory. It is in fact one of a few sites that have existed over the islands chequered history, but is the only one left standing, previous buildings having been destroyed in past eruptions. Men worked here for months at a time, processing sulphur from the ground. In those days, Sulphur was important as an antibacterial component in medicines, alongside several other household uses. Later, when there was not enough sulphur, the rocks were ground and crushed to be sold as agricultural fertiliser. The remains of the plant are now being slowly corroded by the sulphuric atmosphere and sea spray. Unlike other countries, who may have deemed this “too dangerous”, we were free to wander as we pleased through the dilapidated factory. On our return, we headed straight out to sea for the return journey, and were handed lunch boxes and sat back to enjoy the two hour boat trip back to Whakatane. As hoped, we were treated to a pod of common dolphins on the way back which we were able to watch from the boat’s prow. The dolphins swam with us for some time, amusing us with their tricks and ability to ride the bow wave so gracefully. We were treated to a few jumps and tricks, and were able to get really quite close to these amazing creatures. Thankfully, the sea remained calm so returned with settled stomachs – unlike our previous dolphin encounter! As you return to port, keep an eye out for the aptly named Whale Island (Moutohora). Stringent controls mean that this is now a pest free sanctuary for many of New Zealand’s endangered species. You can board a guided trip here too, but sadly time meant that this remains on our bucket list for the next time!